Ministry often means more than gathering people in prayer or lending a helping hand. It can also mean a pick-up soccer game. At 11:30 at night. On an island on the western edge of Maryland’s Eastern Shore. Just ask Brother Emerson Rodriguez, the Franciscan priest who since February has directed the Diocese of Wilmington’s Hispanic Ministry. “I really like to go visit them,” he said of Hispanics on the Delmarva Peninsula. He has been a soccer fan all his life, so when he heard of the late-night pick-up game he decided to visit the players — and to join them. Most of the players work at night and get off late, accounting for the 11:30 start. Brother Emerson heads a wide-ranging ministry in Delaware and on Maryland’s Eastern Shore that includes parish-based ministries at 20 churches, providing the sacraments and other needs to seasonal workers, prison ministry, and a program called Building Intercultural Connections. One of his first goals is to develop a pastoral plan for the next three or four years. A survey soon will be distributed to develop a needs assessment and help the ministry determine its vision and priorities for the plan, targeted to be unveiled in July, Brother Emerson said. 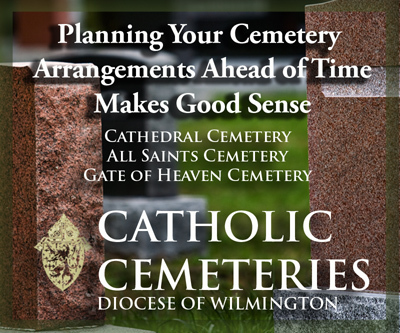 Hispanic Ministry is one of more than 35 Diocese of Wilmington offices and ministries in Delaware and on Maryland’s Eastern Shore supported by the Annual Catholic Appeal. This year’s Appeal target is $4,434,000. 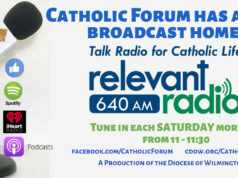 Commitment Weekend, when Catholics in the pew will be asked to make donations or pledges, will be April 9-10. “Blessed are the Merciful, for They Shall Obtain Mercy” is the theme for this year’s appeal. It is taken from Pope Francis’s proclamation of the Holy Year of Mercy being observed this year. This is Brother Emerson’s second Franciscan assignment to Delaware. He was in the novitiate, then housed at St. Paul Parish in Wilmington, in 2001-02. It is also the third time the Peru native has come to the United States for an extended period of time; he has also studied at Catholic University of America in Washington, D.C. He succeeds fellow Franciscan Brother Chris Posch. 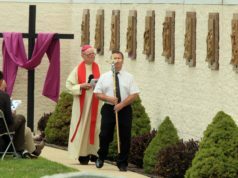 Brother Chris had been part of the diocese’s Hispanic Ministry since the late Bishop Michael Saltarelli started it in 1998. The two worked together the last two weeks of December and all January to ensure as smooth a transition as possible before Brother Chris became pastor of St. Camillus Church in Silver Spring, Md. 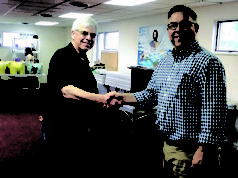 Brother Chris sees in Brother Emerson a new dimension for Hispanic Ministry. One goal Brother Emerson has identified is to get people more involved in the church, especially given the shortage of priests. Signs of that awakening are seen, he said, citing one man who taught himself to play the guitar after seeing Brother Chris pause in his role as priest during Mass to play the guitar for a song. He also sees a need to work with first-generation immigrants in a way different yet complementary to how he works with second-generation immigrants. First-generation immigrants “want their children to be engaged in their faith and traditions,” he said, but the values instilled by society and taught through educational institutions here are not based on the immigrants’ faith and traditions. To the older immigrants “I say to encourage them (young people), but not force them,” Brother Emerson said. At the same time he seeks ways to make the faith and traditions “more meaningful” to young people, and to help them realize how those help their parents cope with the challenges they face. Increased use of social media should help reach the Hispanic community in the diocese and beyond, he said. The ministry’s Facebook page, with photos, reminders of events, and links to other items, receives 700 to 800 hits a week. He envisions a web page that will allow him to combine his past – the scriptural and language background cited by Brother Chris that resulted in Brother Emerson teaching at a university and a seminary in Peru – with his current ministry. A Bible course he now teaches could be offered by video streaming through the website, for example, reaching not only those within the diocese who cannot attend in person but also allowing family and acquaintances in Peru to follow his work. Yet he realizes the need to be among the people, and takes to heart Pope Francis’ admonition that the church should accompany people in their daily lives. That’s one reason he played soccer at midnight on Kent Island. Another is his love for soccer, formed while growing up in Chachapayas, in the northeastern Amazonas Region of Peru. His father, a policeman who also raised rice and cattle on a farm, was an amateur soccer coach and he grew up playing the game. It’s a home-away-from-home feeling, one he shares with many first-generation immigrants served by the Hispanic Ministry he directs. Next articleBorn and baptized the same day (36 years apart) in Chestertown, Md.